There were parts of "Bill & Ted's Bogus Journey" I probably didn't understand, but that's all right, because there were even more parts that Bill and Ted didn't understand. This is a movie that thrives on the dense-witted idiocy of its characters, two teenage dudes who go on amazing journeys through time and space with only the dimmest perception that they are not still playing video games. I missed the enormously popular movie that introduced these characters, "Bill & Ted's Excellent Adventure," and felt myself blessed at the time. But now I'm not so sure. 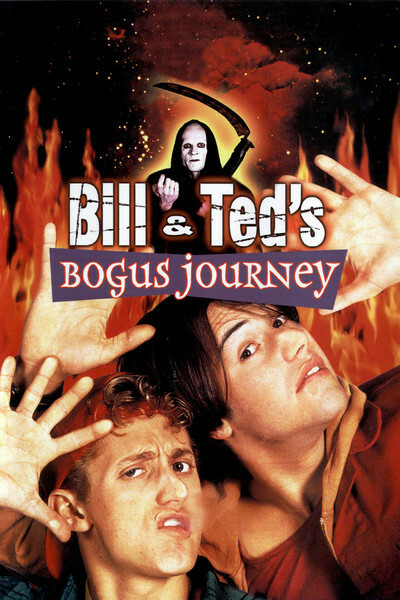 Their "Bogus Journey" is a riot of visual invention and weird humor that works on its chosen sub-moronic level, and on several others as well, including some fairly sophisticated ones. It's the kind of movie where you start out snickering in spite of yourself, and end up actually admiring the originality that went into creating this hallucinatory slapstick. The movie begins far in the future, where students at Bill & Ted's University have the opportunity to chat personally with Thomas Edison and Beethoven, and to study such artistic classics as the "Star Trek" TV series. An evil overlord of time, named De Nomolos and played by that gravel-voiced, white-haired villain Joss Ackland, vows to rewrite history by destroying Bill and Ted (played as before by Alex Winter and Keanu Reeves). He has invented robots that look and act exactly like the two heroes, and are just as dumb, and he sends them rocketing back through time in a telephone booth. Bill and Ted are meanwhile trying to win a rock band contest with their own group, the Wyld Stallyons, which includes a couple of girl musicians they picked up in the 15th century. Startled by the appearance of their robot-doubles, they commence their own journeys through time and space in a desperate attempt to destroy them, save themselves, preserve the book of history, stay cool, and meet cute chicks. The funniest thing that happens to them is their showdown with the Grim Reaper (William Sadler), who looks just as he does in Ingmar Bergman's "The Seventh Seal." In that film (as most of the audience for this one will probably not know), Death played chess with a medieval knight, with the knight's soul at stake. This time the dudes challenge the Reaper to a pocket video game, and beat him, even after he tries to weasel out with an offer of best of three. Death, having lost, has to accompany Bill and Ted on their journey and do what they tell him, and this leads to some of the funniest moments I have seen in any movie in a long time, including one where the Reaper does a little comparison shopping for scythes at the hardware store. One of the stops on the bogus journey is Heaven, created with great imagination and a lot of light and echoing sound effects and a most peculiar conversation with the Deity. Bill ands Ted handle this summit meeting, as they handle everything else in the film, like two dudes for whom "Pee Wee's Playhouse" would be too slow and intellectual. All of the actors (including George Carlin, who turns up in an important supporting role) have a lot of fun with this material, and it turns into more delicate fun, based on more subtle timing, than you might imagine. Many of Sadler's laughs as the Grim Reaper come from simple physical cringing, as he conveys his embarrassment and lost dignity. Of Bill and Ted, I can say that I have not seen Alex Winter much before (he was in "Rosalie Goes Shopping"), but I have seen Keanu Reeves in vastly different roles (the FBI man in the current "Point Break," for example), and am a little astonished by the range of these performances. Like Sean Penn, who immortalized the word "awesome" in a Bill & Ted-like performance in "Fast Times at Ridgemont High," he brings more artistry to this cretinous role than might at first meet the eye. Who is the movie intended for? Your basic "Bill & Ted" audience, for starters -- upward-bound young moviegoers looking for something one notch more challenging than "Teenage Mutant Ninja Turtles." But also for lovers of fantasy, whimsy, and fanciful special effects. This movie is light as a feather and thin as ice in spring, but what it does, it does very nicely.